This week I’m keeping things short and sweet, as I’m writing this on the heels of my mom’s 89th birthday party. My sisters and I were cranking out appetizers all afternoon–what can I say? We love a good party! It’s so fitting that this week’s #SundaySupper is all about parties–bridal and baby showers in particular hosted by Home Cooking Memories. I’ve been on a baking kick, so I’m bringing this French Country Flat Pie, loaded with onions, potatoes, and GruyÃ¨re cheese, all nestled in a biscuit crust. Plus we have a great line up of noshes, main dishes, and desserts listed for you below. Here’s my mom (center) and her sisters today. She’s the baby, you know, as she likes to remind us. Meanwhile, here are some resources to help get you started, whether you’re planning a bridal shower or baby shower. Now, on to this decadent flat pie. This can be served as a main course or cut up into smaller pieces for an appetizer. This is slightly adapted from Biscuits and Scones by Elizabeth Alston. First, prep the vegetables. In a large skillet over medium heat, saute the onion and garlic in the butter and olive oil until the onion softens. Stir in the potatoes, thyme, salt and pepper, cover and cook for about 15 minutes, stirring occasionally, until the potatoes are tender but not overdone. Meanwhile, add the flour, baking powder, pepper and salt to a food processor bowl and give a quick whirl. Add in the butter and pulse until fully incorporated and the mixture looks like fine granules. Add in the cream until a dough starts to form. Transfer to a lightly floured board, and knead about a dozen times. 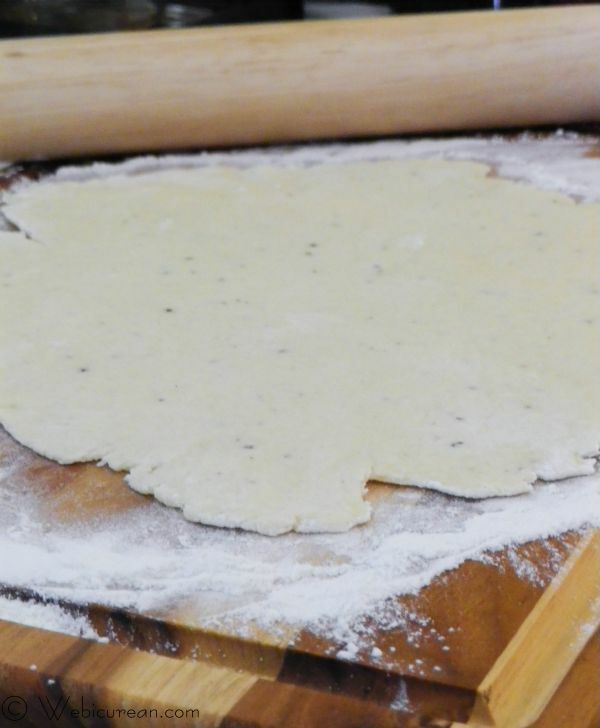 Roll the dough out into about a 14-inch circle and transfer to a baking sheet. Spoon the potato/onion mixture on the dough leaving about an inch around the edge. 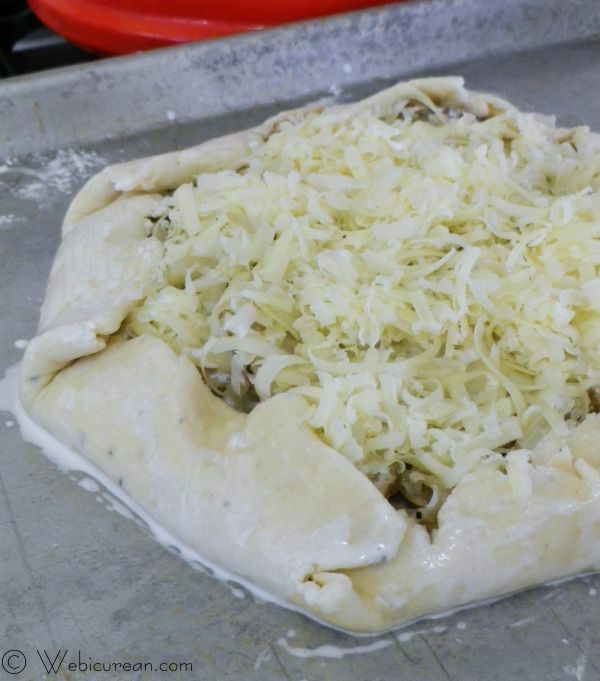 Top with the GruyÃ¨re, then fold the edges of the dough up over the filling, and brush with cream. Bake this about 15 minutes, remove from the oven, pour the remaining cream over the top, then return to the oven for an additional 10 minutes or until golden and bubbly. 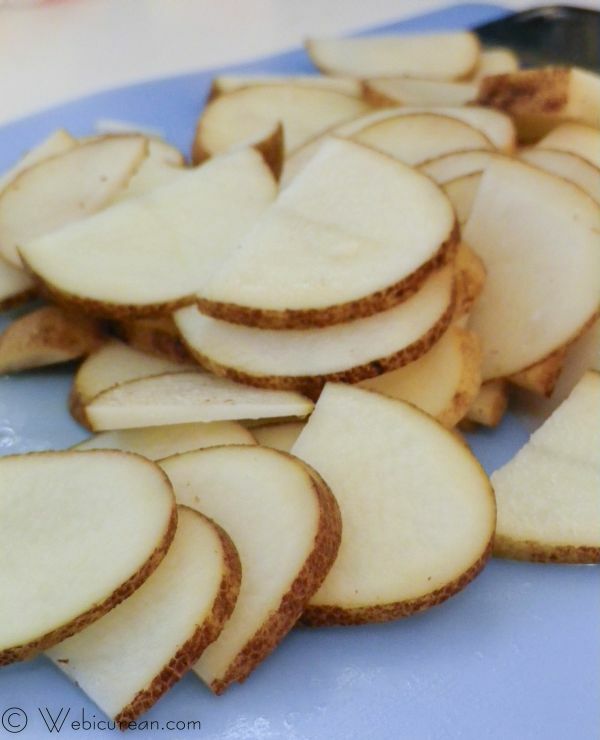 Cut into wedges to serve as a main dish or squares as an appetizer. 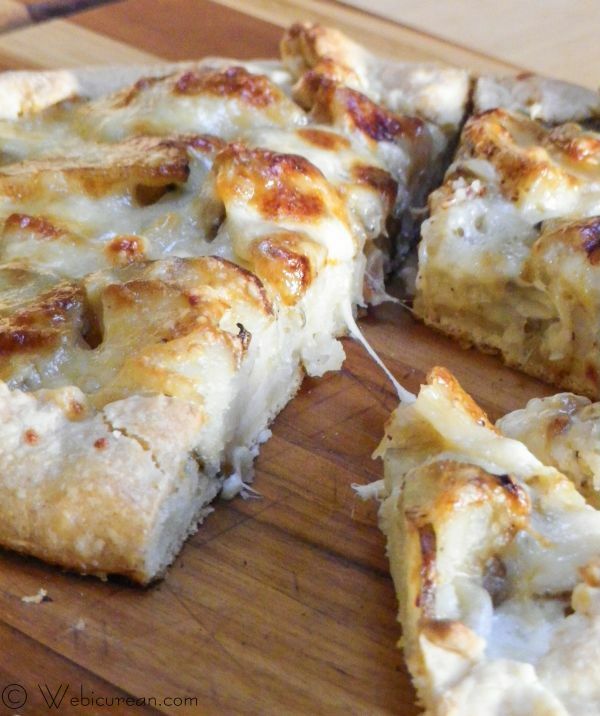 A decadent flat pie loaded with potatoes, onions, and GruyÃ¨re cheese, all nestled in a biscuit crust. Start by sauteing the onions and garlic in the butter and olive oil over medium heat. Cook about 5 minutes or until the onions have softened. Add in the potatoes, thyme, salt and pepper, cover and cook for about 15 minutes, stirring occasionally, until the potatoes are tender but not overdone. 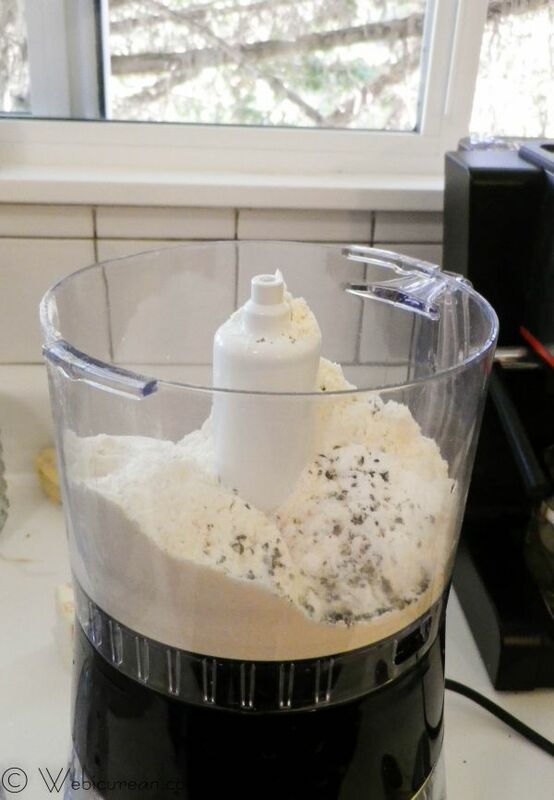 Meanwhile, add the flour, baking powder, pepper and salt to a food processor bowl, and give a quick whirl. Add in the butter, and pulse until butter is fully incorporated and the mixture looks like fine granules. 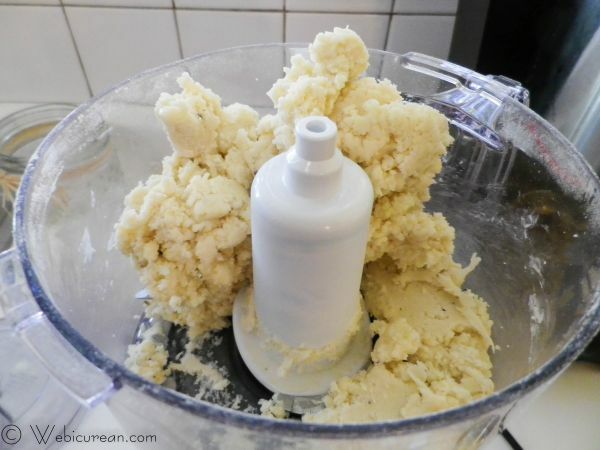 Gradually add the cream until the dough takes shape. Turn the dough onto a lightly floured board, and knead about a dozen times. 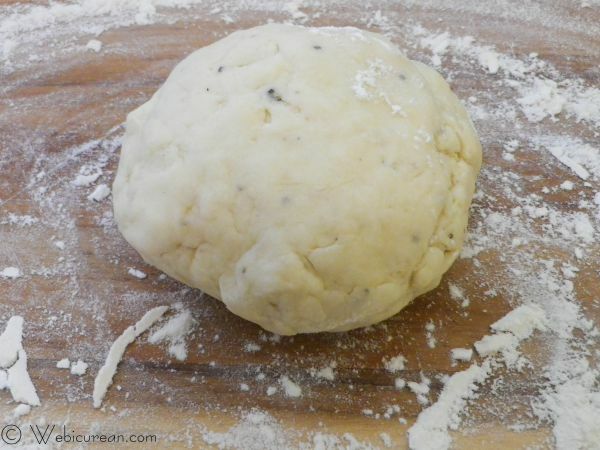 With a rolling-pin, roll the dough out into a 14-inch circle, and transfer to a greased cookie sheet or pizza pan. Spoon the potato mixture into the center, leaving about an inch border around the edge. Top the filling with the GruyÃ¨re cheese. Fold the edges of the dough over the filling, and brush with the cream. Bake 15 minutes, remove from oven, pour the remaining cream over the top, then bake for an additional 10 minutes or until golden brown. Now, let’s see what everyone else has cooked up! Slushy Mango MojitoÂ from The Urban Mrs.
One of the best parts of #SundaySupper is our weekly Twitter chat. If you love food, you definitely want to join us! Just follow the hashtag #SundaySupperÂ on Twitter this Sunday, April 21st at 7pm EST, and weâ€™ll be chatting about food and fun for baby showers, bridal showers, and parties! Want even more #SundaySupper? Follow ourÂ #SundaySupper Pinterest boardÂ for recipes that are sure to impress! Note: I earn a modest commission from any purchases made through the amazon.com links on this page. I’d make this my dinner! 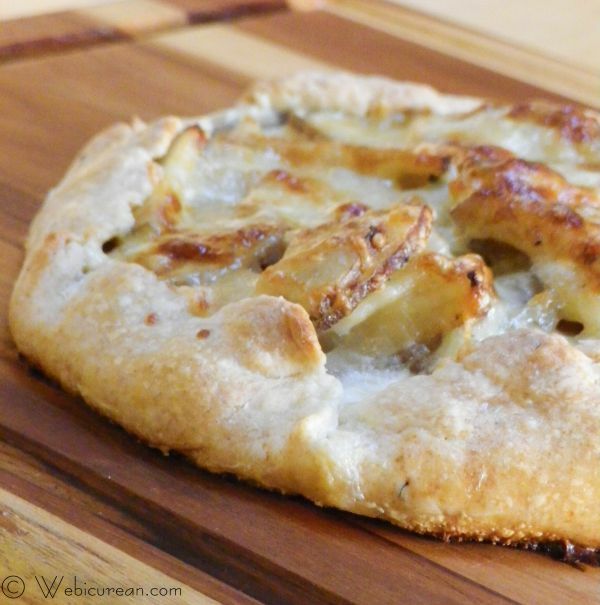 What a fantastic savory galette! Happy Birthday to you mom! And I love the savory pie and the way it is free-formed with the crust. I love the sound of this pie…I’d be rushing in to get my slice. Happy Birthday to your Mom! This pie sounds amazing and the pictures are beautiful. I have to try this. Yum! This would make a good breakfast right? Because I want it now! Jen @JuanitasCocina recently posted..Bite-Size Pecan Tarts ~ April Showers #SundaySupper! A stellar post! From the scrumptious recipe to the lovely birthday party for you mom, I’m charmed! This is SOOO cool! It looks much like my Country Apple Tart, but savory and with all my favorite flavors!!! Can’t wait to try this one. 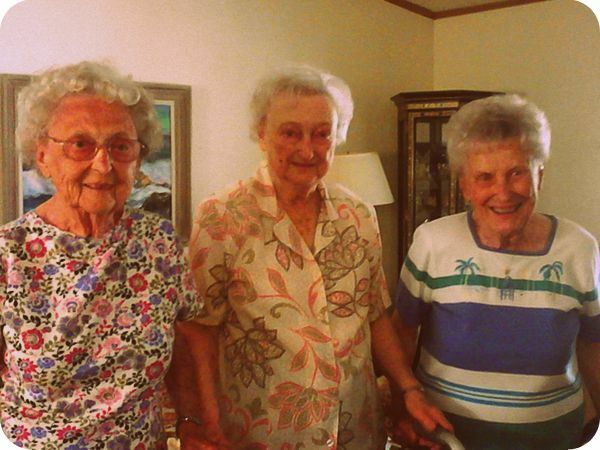 And what a sweet pic of your Mom and her sisters… such a special time, I’m sure! 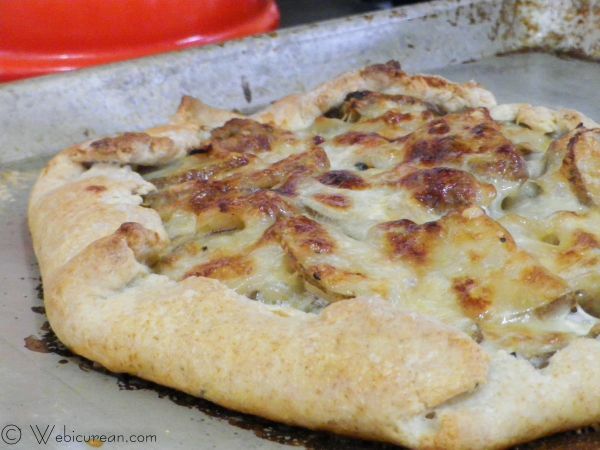 I love all the flavors of your savory flat pie and cannot wait to try it! Your mom and her sisters look great, I bet it was a really nice celebration. Your pie looks simply amazing!! This savory pie is incredible! It’s absolutely gorgeous- I just want to take a bit right now. I love the photo of your Mom and Aunts. So sweet. Thanks for sharing. Such a lovely pic of your mom and sisters, and so great you prepared her birthday! The filling in this galette is so up my alley! Fantastic picture! I hope you had a great party! I can’t wait to give this pie a try! True story: I’m commenting on everyone’s Sunday Supper posts from the bottom of the list to the top. Therefore, I’ve bypassed all of the desserts and other sweet tweets to get to your post and I must say- this dish has my mouth watering more than any other yet! It looks amazing and I can almost smell the gruyere cheese, mmm! This looks so ooey and gooey-YUM! Happy birthday to your mom! What a great photo and I want this so bad! Looks awesome. will probably try to make it this weekend. thx for sharing.